Pray you are all well and in the highest of ‘Eemaan. We ask Allah to grant us the best in this life and the hereafter. May he multiply our good deeds and forgive us of all of our sins. As was advised to us by Shaykh Zaid bin Haadi al Madkhali, then from the sunnah of the Prophet (may Allah’s peace be upon him) was to ask the people when a need arose for the communtiy, to give what they could. Currently the masjid is in need of help in paying its outstanding rent of approximately £2500. We don’t wish to withold anyone’s haqq, and our landlord is owed money which rightfully belongs to him. The community is attempting to raise the funds, but if anyone can help then the reward is with Allah… Click Here for ways to donate. Small updates on our efforts below. May Allah protect us, forgive us and accept it form us. The Activities of The Salafi Centre of Manchester (Al Markaz as Salafi bi Manchester). All praise is for Allah alone the Lord of all creation. We have been established here in Manchester as a masjid for ten years. As time has gone by the call to the Salafiyyah has expanded. Masha’Allah we now have a very busy masjid and the da’wa has spilt over into other mediums. Since we asked for funds to help us in running the masjid, maintaining it and paying our bills last year, our dawa activities at the masjid has increased. learnaboutislam.co.uk with over 400 600 (compared to 300) completely free audios, complete with sets, to download and learn from and share. There are now in Urdu audios as well. sunnaradio.net: Where the talks from our centre here as well as Bolton, Liverpool, Leeds, Loughborough, Oxford, Nelson, Woolwhich London, Stoke on Trent and more… completely free for anyone to listen to on their mobile or on their computer. Furthermore We always have a free and regular flow of da’wa leaflets compiled by Salafi Publication Birmingham as well as making available free CDs for people. As well as the regular lessons in the Masjid, then we try our utmost to hold conferences in the masjid vicinity and outside of it. These are all completely free to attend and we give out the lectures as soon as we are able to physically. Click here for the latest talks and an absolute essential guide to the foundations of practicing Islam properly. By Allah’s grace we have also managed to established a weekend school with 100 children who attend (see salafischool.co) with many children attending. They learn Arabic, Qur’an and Islamic Studies. The whole structure is based upon them gaining a firm footing in the Qur’an and Sunnah, learning and memorising hadith. The masjid is always underfunded meaning that we are usually late with our payments and struggle with costs. This year we had new windows installed, and have had some work done in the masjid. However the masjid is in dire need of maintenance, and due tot the size of the building we really struggle to afford many of these costly repairs. We are due to have new fire doors and exits installed, roof repairs carried out and a fence installed around the centre. Details of all our projects and maintenance can be found here. Masha’Allah we are Salafi and our call is Salafiyyah… and as a result we have no affiliation or link with any biased (hizbi) partisan group, political party, movement or even government funding or backer. We rely on Allah and then the good charitable nature of the people and those that love this call and appreciate the effort put in. 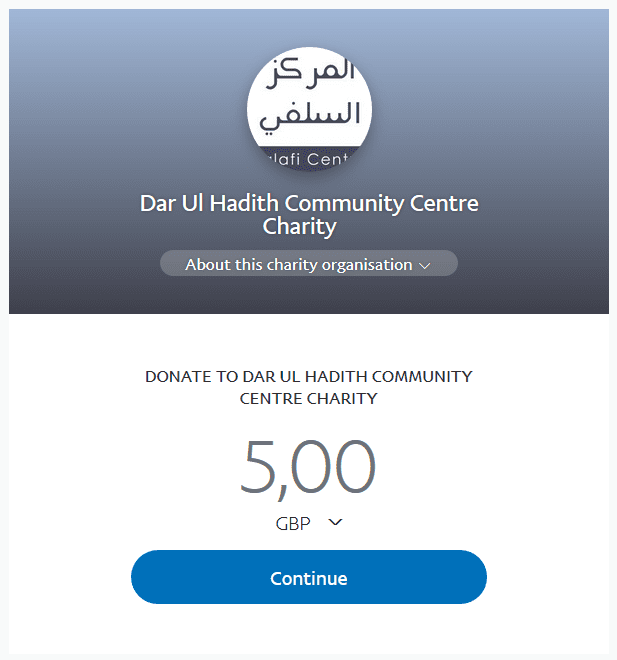 And so all the money raised will go into the da’wa, whether that is for the building itself, or the free materials we give out, or the conferences we hold. So we humbly ask you to help us to continue this effort- to build this masjid and da’wa for Allah’s sake. May Allah have mercy on us all and grant us a position in Jannah.